Everyone knows that bleach can be used to clean various parts of the kitchen but did you know that it can also be pretty dangerous? Bleach does kill germs and makes things whiter but you should seriously be aware of the following before you clean your kitchen. The internet is filled with recipes that tell you to mix bleach with other liquids in order to get a strong cleaner. The problem is that bleach does not mix. You should never mix bleach with kitchen cleaners. This is especially the case with those that include acid or ammonia since that creates a reaction with toxic fumes leading to nausea, chest pain, coughing and others. Just mix bleach with water to be on the safe side. You never know what includes ammonia and the mix would be dangerous. Bleach’s active ingredient will slowly break down based on storage conditions and other factors. While that is great for nature as bleach eventually becomes water with salt, you may end up using something to clean and not get any cleaning done. 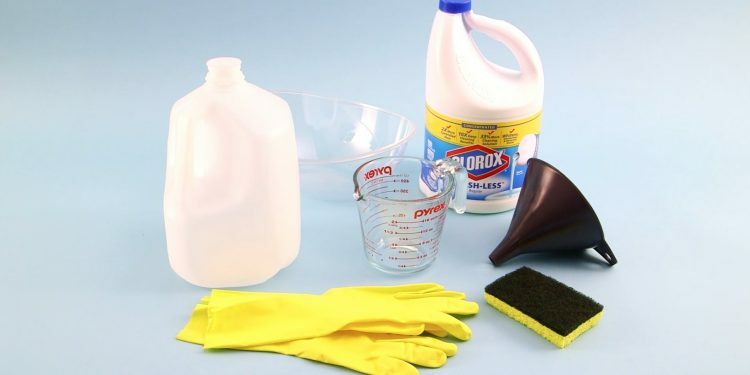 While you do not want to use this on a regular basis, in the event something bad happens and the water supply is infected, unscented bleach would disinfect water if used at a ratio of 1/8 of a teaspoon to one water gallon. After 30 minutes you can safely drink the water. Do you love to have fresh flowers in your kitchen? Most do not have preservative packets but bleach helps you make your very own. One sugar tablespoon and 2 lemon juice tablespoons should be added to one quarter of a part of water. Then, half a teaspoon of bleach is enough to add to that water to end up with a great mixture that prevents bacterial growth and makes flowers last longer.